Here you can see all of your pre-existing reports. Once you've created a report, it will be saved here so you can easily edit and run the report again. Don't have any reports to run? Let's create one! First, click the New Report button in the top right. The type of report refers to where in the Rotageek application your data will be drawn from and therefore what kind of data your report will use. 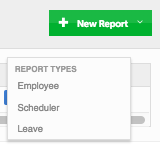 When you choose a report type, the Reports modal will appear. 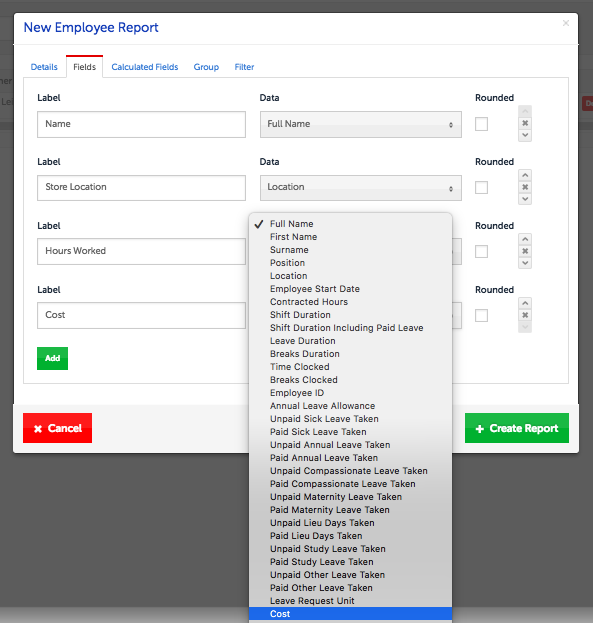 To create the report, fill in the information for each tab, starting with the Details. Make sure you give the report a memorable name and avoid using the character '/', as this will prevent you from being able to export the report to excel. The visibility refers to who can see the report. This allows you to keep the report private (only you can see it) or public (everyone can see it). 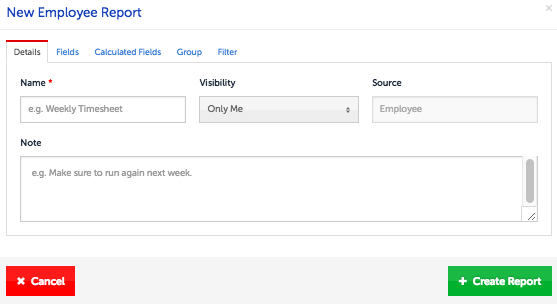 The Fields tab is where you choose what data gets put into the report. For each row, first click on the Data dropdown and select a variable to add. Every field you add will create a new column in the table. You can then fill in the Label box, which displays on the table as a column header. Without a 'Label' the column will not display. You then press Add to reveal a new row, where you can add a new set of data. Do this to your heart's content! Next you have the Calculated Fields tab, where you can compute simple operations with your data. A good example is calculating Hours Worked, which is Shift Duration minus Breaks Duration. The Group tab allows you to group the data in the report based on broad categories, such as Staff Name or Location. Finally, you can choose to Filter the data in your report by location, staff member and/or date range. That's it! When you press Create Report your Report will run, as well as be saved for future use.